This is one of the art cards I've been working on for the Bead Journal Project. DH and I are in a bowling league that meets on Sunday nights. One night, he threw the ball down the lane so hard a chunk of the ball broke off! He still got a strike, though. 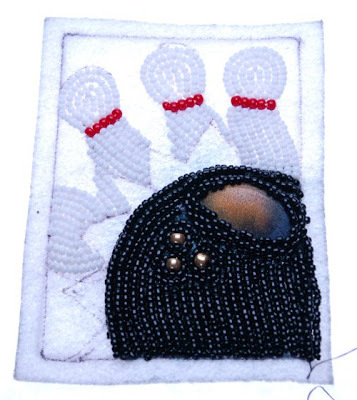 I decided to use the broken piece of ball in this art card by encasing it in beads. I had another layer of beads on the ball but took them off because the gold beads were overwhelming the bigger gold beads I was using for the finger holes. I'll have to think of something else or get some matte gold beads. The pins were fun to bead and it's lookin pretty good so far.